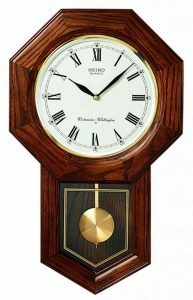 We are equipped with certified clockmakers and are set up to help you get your Seiko clock back up and running. To send in your clock, please fill out our repair form. Please include a check or provide a credit card for $25 with your clock. This will cover the return shipping/handling whether or not you have your clock repaired. If we have not heard back on your estimate (approved/declined) after 21 days your clock will be returned to you. We recommend packing it up carefully, or you could visit a UPS Store (for example) that provides packing/shipping services.